Despite his considerable vocal talent, Birmingham singer Jimmy Powell is likely destined to be most remembered for having displaced Rod Stewart as front-man of the legendary London club group "The Five Dimensions". Although such a legacy would be unfair, Sanctuary Records' anthology collection of Jimmy Powell recordings proves beyond any doubt that his voice was a force to be reckoned with and stands up to any of the great vocalists who dominated the British R&B scene of the 1960s. While not a complete collection, this is certainly the best representation to date and possibly the best we shall ever see of this rather enigmatic figure from the early British R&B scene. Jimmy Powell falls under the category of those 1960s performers whose considerable popularity as a live attraction was never reflected in terms of record sales. The Jimmy Powell story really starts several years prior to the recordings on this CD when Jimmy, who grew up in the Birmingham U.K. suburb of West Heath and had his own band called The Detours, was invited to join local group The Rockin' Berries for bookings over in Germany. This later resulted in him being "discovered" by TV pop show producer and Decca Records scout Jack Good who rejected the Rockin' Berries but later signed up Jimmy to a recording contract. The year was 1962 and while Decca would later regret dismissing "groups" (most notably The Beatles) in favor of solo performers during this pre Mersey-sound era, Jimmy Powell became the first of the 1960s singers from Birmingham to make it onto a record. Jimmy Powell's first single release was 'Sugar Babe' - a rousing R&B record by US singer Buster Brown and a record that Jimmy would forever be associated with. Two more Decca singles followed in 1962 and 1963 which covered similar material but before any headway could be gained in chart terms, The Beatles arrived on the scene and changed everything. Jimmy's response to the 'Beat Boom' was to move down to London and The Marquee Club to check out the R&B scene. It was there where his agent introduced him to a blues band called 'The 5 Dimensions'. Jimmy Powell was soon installed as lead vocalist of the group but this did not sit well with the harmonica player/vocalist of The Dimensions - a young and at that time unknown Rod Stewart. The singer was apparently frustrated with their manager's lack of confidence in his ability as front-man so Jimmy's arrival was not met with enthusiasm. Rod soon departed and the rest, as they say - is history! This CD which was compiled and co-ordinated by Sanctuary's Roger Dopson (who also worked on the excellent Rockin' Berries anthology - see review this page), comes with an extensive fold-out of sleeve notes by David Wells. This includes a great collection of rare photos showing Jimmy in action as well as various line-ups of The Five Dimensions and associated memorabilia. The audio quality on all tracks is excellent and listening to them it's hard to believe most were recorded more than thirty years ago. The new Jimmy Powell collection on this CD begins chronologically from 1964 with the first two singles (A and B sides) that were released after he signed to the Pye Records label. This starts with Jimmy's own self-composed rocker 'That's Alright' which was coupled with the Bo Diddley song 'I'm Looking For A Woman'. For collectors though, it's likely the next two tracks that will attract the most attention as both a re-make of 'Sugar Babe' and 'I've Been Watching You' feature the pre-Led Zeppelin Jimmy Page on session guitar along with bass guitarist John Paul Jones (Clem Cattini was on drums). This version of Sugar Babe is arguably the best and features Jimmy Powell in top screaming vocal form. Despite the promise, no chart action resulted from these releases and Jimmy soon found himself firmly entrenched in the club circuit backed by the latest line-up of the Five Dimensions. 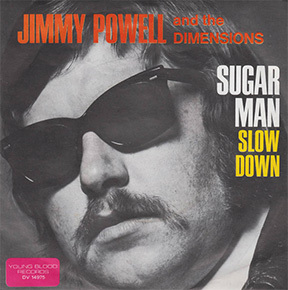 By 1966, Jimmy Powell had signed to Miki Dallon's short-lived Strike Records label who issued the soulful 'I Can Go Down' but while a great track, the timing was bad as by this point, the charts were dominated by pop groups. 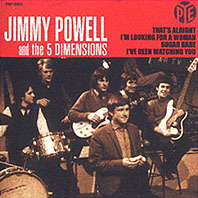 The next six tracks on the CD comprise Jimmy Powell's releases on the Young Blood label between 1969 and 1970 where he is backed by his own "Five Dimensions". Of these, 'Captain Man' is a re-make of Jimmy's 1967 recording of the same song but with a great "live" feel. Bobby Darin's 'Sugar Man' and Miki Dallon's own 'Slow Down' are given a similar treatment. 'House Of The Rising Sun' and 'Witness To A War' feature a more sophisticated and orchestrated production. To this listener, it's the latter track that really stands out on which Jimmy Powell shows amazing versatility with an out-of-character laid back vocal to produce a powerful anti-war anthem. 'Strangers On A Train' and 'Ivory' are both Jimmy Powell compositions and certainly good enough to have charted while his cover of the Beatles 'Back In The USSR' works well as a great dance track. The compilation also includes Jimmy Powell's version of Chris Farlowe's 1966 hit 'Out Of Time' - a song composed by the Mick Jagger and Keith Richards. The remaining tracks on the CD are compiled from Jimmy Powell's early 1970s recording forays up to 1973 and include selections from two solo albums which have been long since deleted. 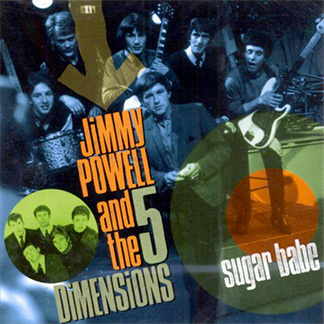 Many of these tracks were composed by Jimmy himself and all showcase his distinctive vocal style although it's not indicated if any of his "Five Dimensions" are also present on the recordings. Included is a re-vamped version of Sugar Babe as well as a Randy Newman song 'Hold On (Have You Seen My Baby)' plus 'Roosevelt And Ira Lee' - credited to Tony Joe White. These, as well as the remaining tracks on the collection, all show Jimmy Powell in fine form which makes it seem all the more a mystery as to why he was seldom heard from after the early 1970s. Indeed, his own compositions such as Hipster, 'Real Cool', and the rather mocking 'Progressive Talking Blues', show a diversity and sophistication unlike much of his earlier work. To sum it all up, Sanctuary's Jimmy Powell compilation is a wonderful tribute to one of the West Midland's greatest vocal talents from the 1960s as well as to the many fine musicians who recorded with him. It will be appreciated by all those who are interested in the British R&B scene from that era and indeed anyone who loves the energy generated by emotionally-charged performances against the backdrop of a gritty blues-club atmosphere. 20) Do You Really Have A Heart?